Cotton fabrics from some of our favorite sources. 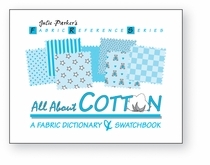 This is an updated version of the source list in our book, All About Cotton: A Fabric Dictionary & Swatchbook. We update the list each time we print the book, but as soon as the ink is dry, something changes. We no longer sell the updated source list because we can post it here for free. Sells 100% organic cotton fabrics produced entirely in the United States. Wide range of wovens and knits, plus an interesting assortment of "eco-friendly" notions. Phone: 877-573-2913. Delicate laces and fine cotton fabrics, including batiste, broadcloth, lawn, voile, organdy and piqué, plus hard-to-find Sea Island cotton. Order online or by phone: 504-832-0101. Authentic hand-waxed batiks and hand-painted fabrics from around the world, plus an interesting selection of handwoven fabrics, such as ikats and stripes. Toll-free: 800-228-4573. Four-floor retail store with floor-to-ceiling displays of fabric of all fibers. Small fee for custom sampling to mail-order customers who provide very specific details about the types of fabrics they seek. Phone: 415-392-2910. All-cotton prints and solids for quilting and other projects. Phone: 208-345-5567. Ready-to-dye fabrics, clothing blanks and supplies for textile artists. Sells bleached and unbleached versions of some fabrics. Cotton inventory includes fleece, French terry, duck, gauze, interlock, jersey, poplin, ribbing, sheeting and others. Toll-free: 800-542-5227. Wide variety of quality fabrics of all fibers, including cotton prints, knits and novelties. Many fabrics are from designer cutting rooms. Inventory changes quickly. Phone and fax: 215-542-1082. Extensive selection of popular fabrics of all fibers. Wholesale discounts available on full bolts. Also handles mail order and special requests. Large warehouse-style store is worth a visit. Toll-free: 888-896-1478. Extensive inventory of quilting fabrics and supplies. Bills itself as the largest quilting store in America, with more than 10,000 bolts of fabric. If you visit their store, you can admire (and buy) hundreds of handmade quilts from all over the United States. Toll-free: 800-525-8086. Extensive selection of fashion fabrics of all fibers, plus home-decorating fabrics and upholstery. Plain and fancy cottons are abundant. Discounts available to qualified buyers. Large warehouse-style store is worth a visit -- tour buses are common. A second store is located in Beaverton. Phone: 503-786-1234. Large collection of imported and domestic cotton shirtings, including broadcloth, oxford cloth, pinpoint oxford, novelty weaves, tone-on-tone and yarn-dyed strikes, checks and plaids. Small fee for set of samples. Phone: 631-755-1230. Organic cottons, undyed fabrics, dyes, paints and supplies for textile artists. Free catalog. Samples available for a small fee. Discounts on full bolts and large orders. Toll-free: 800-442-0455. Annual fee for seasonal mailings of fine fabrics from Italy, France and elsewhere. Specializes in fabrics made from natural fibers. Carries Liberty of London and Viyella cottons. Oversized samples are nicely presented and packaged with care so you won't get them mixed up. Service is friendly and fast. Toll-free: 800-290-2739. Wholesale source of cotton fabrics to qualified buyers only. Extensive inventory of domestic and imported cottons in many different weaves, weights and colors. Toll-free: 800-223-2031. Independent fabric store with two floors of mostly natural fibers, including a whole roomful of cottons from around the world. Swatches available. Phone: 510-845-6106. Prewashed, resin-free fabrics of cotton and other fibers that are ready to dye, paint, print and finish. Carries a wide variety of different types of cotton fabrics, all of which are white or natural in color. Samples available for a small fee. Phone: 570-603-0432. Cotton fibers, yarns and fabrics made from FoxFibre®, naturally colored cottons developed by Sally Fox. Colors are earthy browns and greens, along with whites and ivories. Most FoxFibre® is organically grown and sold to clothing manufacturers, but woven and knit yardage is available. Phone: 530-796-3388.